Mexico’s three low-cost carriers are planning another year of rapid growth as they continue to benefit from the 2010 collapse of Grupo Mexicana. Interjet, Volaris and VivaAerobus saw their combined domestic passenger traffic grow by 41% in 2011 to 13.8 million passengers. Their international operations expanded even faster last year albeit on a very small base, recording 91% growth to 1.2 million passengers. More rapid growth is expected across both the domestic and international networks as the Mexico’s LCC trio plans to take delivery of 17 additional aircraft in 2012, representing 20% growth and resulting in a combined LCC fleet of 101 aircraft. 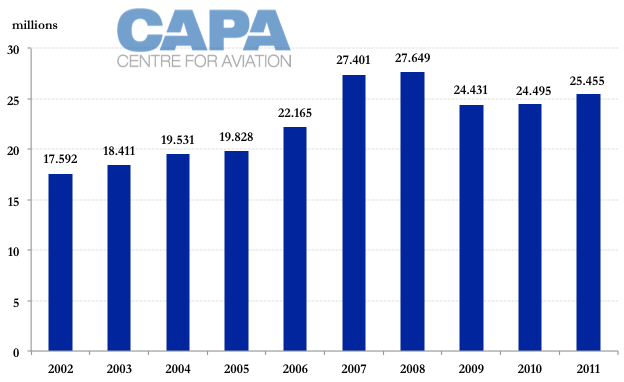 The LCC penetration rate in Mexico’s dynamic domestic market reached 54% in 2011, compared to 50% in 2010. The total domestic market grew by 4% in 2011 to 25.455 million passengers, which is still 8% below the peak of 2008 when Mexican carriers transported 27.649 million domestic passengers. But the fact Mexico has been able to grow at all the last two years (in 2010 growth was under 1%) is quite an achievement given the sudden collapse in Aug-2010 of Mexicana, which had about a 28% share of the domestic market. Interjet has recorded the fastest domestic growth since Mexicana’s exit. The carrier ended 2011 with a 25% share of the domestic market, second only to Grupo Aeromexico’s 40% share, according to newly released data from Mexico’s DGAC. Interjet was able to record an impressive 9ppt domestic market share gain in 2011 by growing its passenger traffic 58% to 6.337 million passengers. Note: Based on scheduled domestic passengers carried for the entire year. Grupo Mexicana ceased operations in Aug-2010. Prior to ceasing operations the group had about a 28% share of Mexico’s domestic market. Grupo Mexicana includes Mexicana, LCC unit Click and regional unit Mexicana Link. Grupo Aeromexico includes Aeromexico, regional unit Aeromexico Connect and charter unit Aeromexico Travel (which operated scheduled domestic flights from Sep-2010 to Dec-2010 to help fill the sudden void left by Mexicana’s suspension). Interjet currently operates 35 domestic and four international routes with a fleet of 33 all-economy A320s. The carrier, which has carried over 19 million passengers since launching services in Dec-2005, was entirely a domestic operator until Jul-2011. In 2H2011 Interjet launched four international routes – Mexico City to Havana, Guatemala City and San Antonio and Toluca to San Antonio – and carried 75,000 international passengers. Interjet is planning more international expansion in 2012, starting with Mexico City-Miami, which will be launched in Feb-2012 with 12 weekly flights. The carrier is also expected to continue expanding domestically although a repeat of the 58% growth recorded in 2011 will certainly not occur as the race to fill the domestic void left by Mexicana is now over. Interjet will be in position to launch several more international routes in 2H2012, with a likely focus on catching up with rival Volaris in the US market, as well as pursue modest domestic growth. 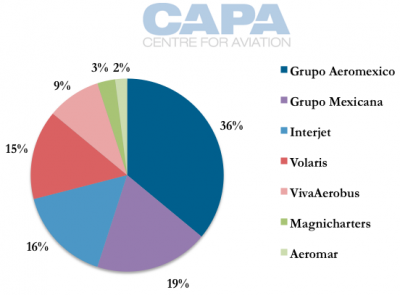 Interjet tells CAPA the carrier is committed to adding six aircraft in 2012, with all six deliveries coming in the last seven months of the year. The carrier plans to add four A320s, including two in June and two in November, and expects to take delivery of its first two Sukhoi Superjet 100s in November and December. It currently operates 33 A320s and, according to CAPA data, has eight additional A320s plus 15 Superjet 100s on order. Interjet became Mexico’s largest domestic LCC based on total passengers in 2010 after the collapse of Mexicana LCC unit Click, which had about a 15% share of the domestic market (Mexicana mainline had about a 10% share and regional unit Mexicana Link had a 3% share of the market). Interjet had already overtaken Volaris as a larger domestic carrier after Volaris started focusing more on the US market, which it entered in Jun-2009. Growth on transborder routes has been even more rapid as Volaris has tried to fill some of the void left by Mexicana, which was the largest Mexican carrier in the US, and exploit its partnership with Southwest Airlines. Volaris recorded 81% growth in scheduled international passengers in 2011 to 1.048 million. Volaris currently operates 17 international routes to seven destinations, all of which are in the US. Domestically the carrier, which has carried over 20 million passengers since launching services in 2006, now has 39 routes to 24 destinations. Volaris is expected to continue pursuing rapid growth in the US market, where so far it has focused primarily on California, which accounts for five of its seven destinations. Like Interjet, further domestic expansion is also anticipated in 2012 as the carrier’s fleet expands this year by 21%. Volaris tells CAPA it plans to take delivery of seven additional A320s in 2012, giving it a fleet of 41 all-economy A319/A320s. The LCC says it now has 56 A320s on order, including 14 aircraft for delivery in 2012 to 2014 and 44 aircraft (including 30 A320neos) for delivery in 2015 to 2020. VivaAerobus focused entirely on domestic expansion, particularly at Mexico City, in the 12 months following Mexicana’s collapse. But Mexico’s third largest LCC resumed expansion of its small US network in 4Q2011, adding four gateways for a total of six. More US expansion for VivaAerobus is expected in 2012 while domestically the carrier has already announced three new routes will be launched in March: Cancun-Tuxtla Gutierrez; Cancun-Villahermosa; and Reynosa-Mexico City. VivaAerobus, which launched services in 2006, now serves 26 domestic destinations, which is the second most among Mexican carriers after Grupo Aeromexico. VivaAerobus is able to maintain a larger network than Interjet and Volaris despite its significantly smaller market share because it focuses more on thin point-to-point routes. A majority of its routes, including all its international routes and the three new domestic routes being launched in March, are served less than daily. VivaAerobus recorded 26% domestic traffic growth in 2011 to 2.936 million passengers as its share of the market increased by 3ppt to 9%. The carrier’s small international operation recorded 49% traffic growth last year to 76,000 passengers, according to Mexican DGAC data. VivaAerobus follows a purer no frills models than Mexico’s other LCCs. It also operates older aircraft, currently at 17 Boeing 737-300s and says it plans to add four more of the type this year, with two deliveries slated for 1H2012 and two for 2H2012. VivaAerobus has already added 10 737-300s since the collapse of Mexicana in Aug-2010. All three of Mexico’s LCCs as well as market leader Grupo Aeromexico have clearly benefitted from Mexicana’s demise. All of the remaining players, which also include regional carrier Aeromar and leisure carrier Mangicharters, have been able to grow and fill at least some of the void left by Mexicana domestically. Even more importantly, profitability has improved significantly across the industry as load factors and yields have increased. With Mexico’s economy only expected to grow by about 4% in 2012, there is some risk overcapacity and potentially irrational pricing, which plagued the Mexican market prior to Mexicana’s collapse, could return. But the market should be able to absorb annual capacity increases in the high single digits. Mexico’s domestic market is still 8% smaller than it was in 2008, when Mexico recorded 27.6 million domestic passengers. Mexico’s industry overall is much healthier compared to 2008 as in addition to Grupo Mexicana four other Mexican carriers have since ceased operations. Aviacsa exited in 2009 while Aerocalifornia and two LCCs, Avolar and ALMA, exited in 2008. 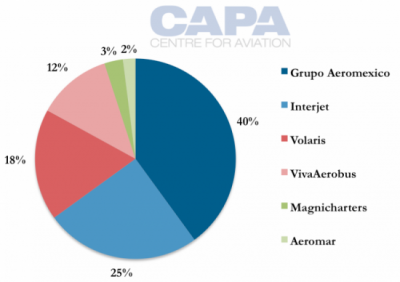 Combined these four carriers accounted for about 23% of the Mexican domestic market. The risk of returning to an overcapacity situation domestically also seems quite low because there remains an opportunity for Mexican carriers to deploy a significant amount of additional capacity in the international market. Mexican carriers combined transported 4.774 million scheduled international passengers in 2011, a 22% decrease compared to 2010. Foreign carriers, however, have successfully filled some of the void left by Mexicana in the international market. Foreign carriers transported 20.535 million passengers to and from Mexico last year, a 12% increase compared to 2010. US carriers, which account for 72% of foreign carrier traffic in Mexico, recorded 10% growth on Mexican routes in 2011 to 14.793 million passengers. Mexican carriers are now aiming to win back some of the market share lost to US carriers in the US-Mexico market since Mexicana’s demise. In addition to the three LCCs, Aeromexico has been expanding its transborder operation. The carrier has said most of its international expansion in 2012 will be on US routes as it has already significantly expanded its Latin American operation, with six new destinations launched in 2010 and 2011, while its long-haul operation cannot be expanded until 2013, when its first batch of new Boeing 787s are due to be delivered. Grupo Aeromexico flew 3.6 million international scheduled passengers in 2011, a 46% increase compared to 2010. But Aeromexico’s international operation has still not reached the size of Mexicana’s former international operation. In only the eight months it operated in 2010, Grupo Mexicana, which had a much larger US operation than Aeromexico but a smaller long-haul network, carried 3.1 million passengers. Domestically Grupo Aeromexico recorded 15% traffic growth in 2011, based on Mexican DGAC statistics, to 10.2 million passengers. The group captured 40% of the domestic market in 2011, compared to 36% in 2010. Aeromexico is planning further domestic growth in 2012 as additional E190s are delivered to its regional subsidiary Aeromexico Connect, which already carries more domestic passengers than Aeromexico mainline. Aeromexico Connenct plans to use the new E190s to replace ERJ-145s on some of its regional routes, freeing up the ERJ-145s to launch services to small Mexican cities not currently in the group’s network. Aeromexico Group expects to expand capacity by 12% to 13% in 2012, with a focus on US and regional domestic routes, as nine to 10 additional aircraft are delivered. The group plans to end 2012 with a fleet of 115 to 116 aircraft.